You can't beat a laser printer for text quality on plain paper, and this one's a beaut! When reviewing inkjet printers, we'll often call the output 'laser-sharp'; that's because laser technology still gives phenomenal results, especially for text, and especially on standard 80gsm (grams per square metre) paper. Add in rock-bottom running costs, and it's clear that the humble mono laser still has a place, particularly in businesses. Lexmark is often fairly criticised for the quality of its inkjet prints, but it produces cracking lasers. The styling's sober, but the engine underneath is capable of great results. There's little difference – either in terms of speed and quality – when switching between 600, 1,200 (the default) and 2,400dpi, but text quality on plain paper trounces inkjets. Image quality is less impressive – especially with detail in shadows which tend to get lost to black – but it's competent enough. It belts through pages, too – taking just 45 secs for a 20-page text document – and isn't sluggish at getting the first page out. Duplex is supported for two-sided printing, and the same document, printed duplex, completed in one minute and 20 seconds. PostScript is supported – good for design pros, though the 32MB RAM would choke on big jobs – and while the 250-sheet paper drawer is small, you at least can add an optional 550-sheet drawer. 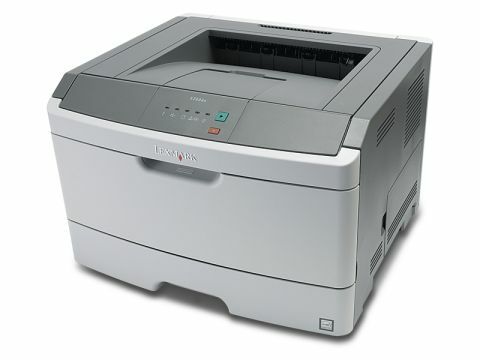 With USB and Ethernet ports, the E260dn is ideal for small workgroup or personal use; it lacks some features like PIN-protected printing and job storing, but it's capable of great prints.